Is no product sacred at this year's MWC show, due to start in just a few short hours? I only ask because photos of the Galaxy S II and 10.1-inch Galaxy Tab have appeared, showing off that sch-a-weet Honeycomb UI. 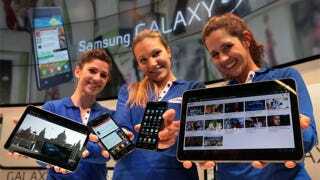 Samsung Prepping 10-inch Galaxy Tab For Weekend Debut? As we heard previously, the 10.1-inch Tab will have a resolution of 1280 x 800, so will be the bigger daddy to the original Galaxy Tab, which measured 7-inches. A little friend will be added to the family today though, according to both Samsung Hub and Engadget—the Galaxy S II, which will have a 4.3-inch Super AMOLED WVGA screen (making it more of a smartphone than a tablet, really). This phone/tablet will thin down to 8.49mm at its slimmest point (the iPhone 4 is 9.3mm, which until recently was the world's thinnest), and it'll run off a 1GHz dual-core processor. As with the Galaxy Tab tablet, it'll also have an 8MP camera, but as to whether Samsung's slicked its UI over the top of Android, bringing features under the Readers Hub, Social Hub, Games Hub, and Music Hub nests, well, the search is still out for that piece of intel. We weren't too enthralled with Samsung's UI on the original Tab (in fact, our Matt Buchanan described it as feeling "like Chinatown knockoffs of Cupertino software"), so let's hope Samsung's ironed out some of those kinks this time—or preferably just ditched it all together. Engadget's hearing the tablet will be a "Google Experience" device, meaning our luck could be in today.